Choosing the correct colors for your wedding can be difficult. There are so many options (have you seen a color wheel?)! Choosing the correct color scheme is especially important because the entire wedding is built around the wedding colors. The flowers, furniture, wedding party apparel, (literally everything) incorporates the wedding colors. With so many options (and so much pressure) how do you choose? You can choose your favorite colors, trendy colors that go with a theme, or you can choose colors that hold meaning! On top of being a gorgeous color, blue is something special because of the meaning behind it: depth and stability. When we get married, we want something that will last. We want our relationships to have meaning and depth. We want to be able to rely on one another, we want stability. Blue is the perfect color for a wedding because it means exactly that: depth and stability. 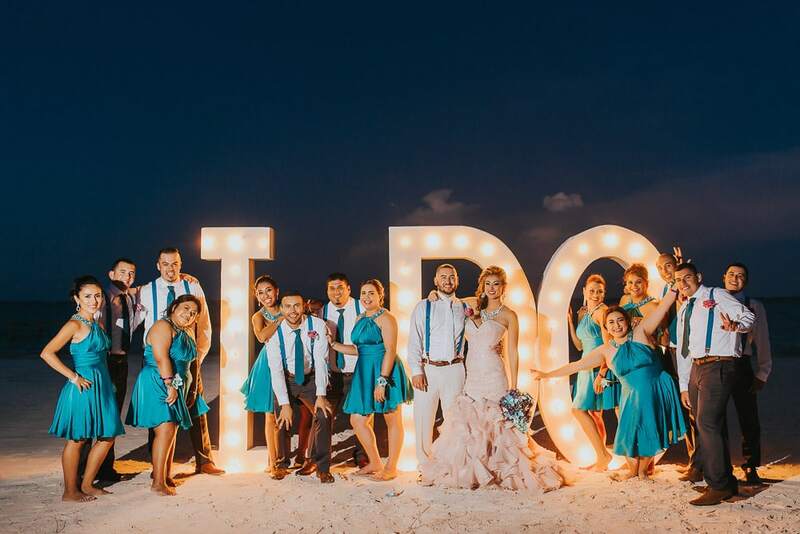 Outside of its deeply romantic meaning, blue is a very popular color for a beach wedding. It matches the sky, the ocean, it’s flattering on all complexions, it just works all around! Silver is another popular beach color! It goes well with most colors (blue, coral, green, etc,.) and is often associated with glamour, wealth, and sophistication. Brides who choose silver as a wedding color will find that it lends a certain elegance and grace to their wedding. It also has a modern feel to it which may appeal to the average millennial! So, if you’re glamorous, modern, and sophisticated (or just aspire to be), then silver may be for you! Yellow is a great beach wedding color. Whenever I look at the color yellow, I can’t help but feel a little happy inside. To most brides, yellow brings many fond memories. Hot summer days, fun at the beach, dandelions popping up through the cracks in the side walk, these are all fond memories that everyone has. Which is exactly why yellow is a fantastic color for a wedding. Fondness, joy, happiness, these are all things that this sunny color brings to the table. Why not all dressed in white? 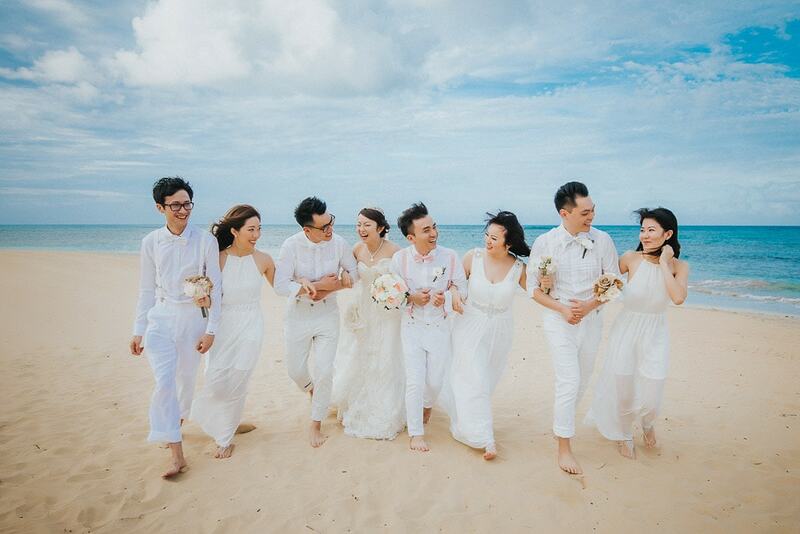 Have you thought about how it would look if everybody in the bridal party was dressed in white? It also holds a great meaning, white is usually associated with goodness, purity, faith and…perfection. It is a symbol of new beginnings and inherently a positive color. It looks particularly good on the beach with the blue of the ocean and sky and the yellowish or white sand. Gold is a beautiful color with romantic meaning: love and courage. For this reason, it may be the most romantic color of them all. Love is what brought you together and it will be what keeps you together when times get hard. Courage is what brought you together in the first place because it takes courage to open up to someone. It takes courage to propose, and it takes courage to commit to another imperfect human being. It takes love and courage to have a happy marriage. Why not choose a color that signifies both? 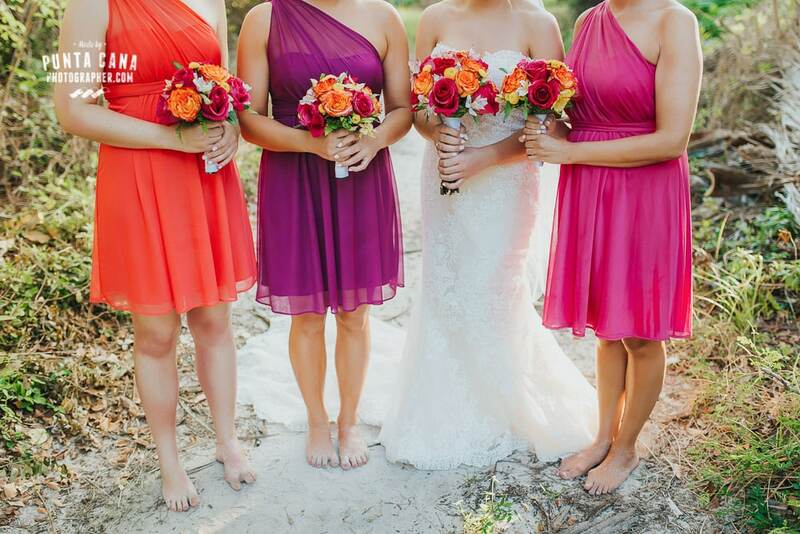 A trendy new idea for bridesmaid’s dresses is ombre gowns. These dresses fade from cool cream to an ocean blue and can be very elegant. I have also seen some ombre combinations that were created to mimic a sunset. The gowns began in a sunny yellow and each dress gradually changed colors until the final gown was a deep purple. It looked absolutely magnificent! A fun fact: ombre is a French word that means, “having colors or tones that shade into each other…” (Webster Dictionary). Though ombre may not have a widely known romantic meaning, we do know that it is a beautiful option for a wedding. Choosing your wedding colors is a big deal. It can add a lot of stress on a bride. Remember that you can outsource, delegate, and ask for the opinions of your close friends and relatives. They’re bound to have at least one good idea/tip that will make your wedding day special. For those of you who have already chosen your wedding colors, what colors do you have in mind? Did the meaning behind the colors impact your decision? What other thoughts do you have regarding wedding colors and meaning? What are the best wedding color combinations you’ve seen? Have you seen some truly dreadful ones? Tell us about it in the comments. Happy wedding planning!